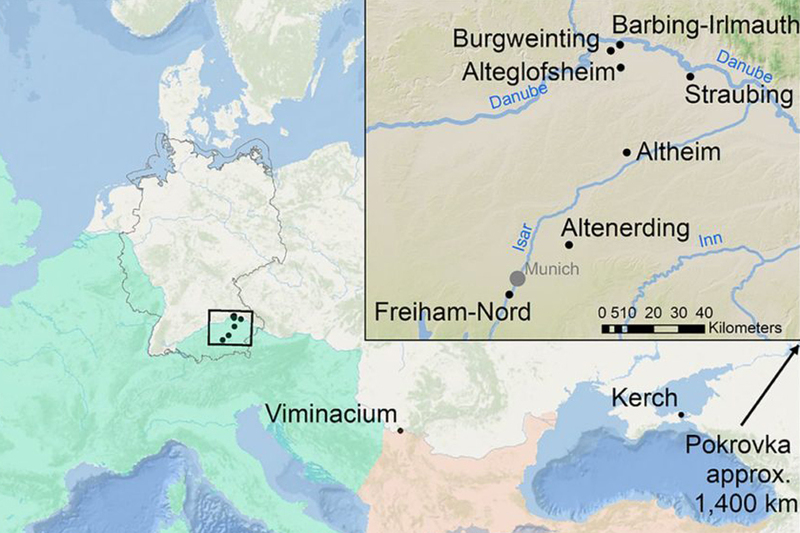 Recently the human remains from 41 graves from six early medieval cemeteries in Southern Bavaria yielded genomic data showing that while men generally had ancestry resembling northern or central Europeans, the women exhibited a very high genetic heterogeneity. Map of southern Bavarian burial grounds from the Early Middle Ages with geographic indication of migration of females with elongated skulls. Source: Anton Doll. The early medieval burial grounds around Altenerding are justly famous for their plague victims, whose aDNA revealed the genetic imprint of the Justinian Plague as being of the same kind as the Black Death. The archaeological excavations have uncovered a multitude of detailed information about their daily life as well as burial customs. Now recent studies of their aDNA have added to this profile helping us to know about the ancestry of these people and the complex demographic processes, which made up the populace of some of the migratory movements of the 5thand 6thcentury. The first mention of the Baiuvarii – present-day Bavarians – is credited to the historian Jordanes, who wrote about them in his book Getica in 551. Settled in the present-day upper and lower Bavaria, it has traditionally been argued that these Baiuvarii were composed of a mixture of the resident provincial Roman population plus immigrants from north-eastern Bavaria and Bohemia as well as their descendants (p. 151). The new studies of the aDNA of some of these people show that the picture is much more complex. First of all the study of the genomic data documents that people – apart from two females from Greek or Anatolian descent – predominantly exhibited a northern or central European ancestry, more precisely located in present-day northern France, the Netherlands, and Northern Germany. No traces were found of southwestern European DNA. Thus the authors conclude that the genetic profile of the population argue against any kind of significant admixture between the local migrants from the north and the Roman militia. Further, one of the features of some of the skeletons in the five locations studied, is their elongated skulls, artificially created during early childhood. In the Bavarian sample these skulls belonged exclusively to females and could be detected in 14 individuals. One of the most striking results of this study is the genetic difference between Early Medieval individuals with or without elongated skull, writes the group of scientists. While both females and males without this artificially induced deformity exhibited a common ancestry of northwestern and central European descent, the females with elongated skulls were genetically much more diverse. It thus looks as if local Bavarians did not artificially deform the heads of their children as has been suggested elsewhere. Such females likely migrated from southeastern Europe, witnessing to a system of exogamic exchanges of females between Baiuvarii and the steppe people (the Huns, Samatians and Avars). However the study suggests that this explanation does not cover the genetic findings. The authors conclude that the genomic analysis of the type carried out on the 41 individuals in this sample, demonstrate the need for more micro-analyses of the same type. Such studies are essential to “better understand the complex patterns of migration, admixture, population structure, growth, and selection during more recent times”, they write. IN: PNAS March 27, 2018. 115 (13) 3494-3499; published ahead of print March 12, 2018. Altenerding in Oberbayern. Struktur des frühmittelalterlichen Gräberfeldes und Ethnogenese der Bajuwaren. The post Genetic Perspective on the Bavarians from the Migration period appeared first on Medieval Histories.